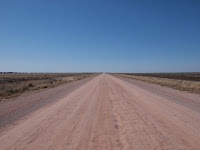 After leaving Tibboburra, we headed toward Bourke, and yes the back o' Bourke is as bad as you'd think. Barren and flat, but really not that much different from what we'd be driving through in SA - except the Flinders Ranges. I always thought that WA was the flat and barren country specialist, but it seems that SA has really cornered that market. We hit Bourke for lunch, but it seems that Bourke was closed, only the last person forgot to turn out the light and put up the closed sign. What a depressing place, NOTHING was open, not even a cafe or a pub. Everything was battened down and security grilled. We did see a horse in someone's front yard though. From Bourke we headed to Dubbo for the night. Gave up on trying to find a steak that was edible and went for fish and chips with a very respectable pinot gris. Breakfast was at our favourite patisserie in Wellington where they do the best pain au raisin outside of France, shame the tea was undrinkable. Next stop, St Malo Bakery in Crows Nest for real coffee - man, I sorely missed a decent long black. Coffee is not a strong point in the desert.